All morning Wednesday, April 4 and Monday, April 9 approximately a dozen student, faculty and staff volunteers from the Earth and Physical Sciences department gathered to complete the landscape surrounding the UC Davis California Rock Garden (a Geology GATEways Project) on the south and east sides of their eponymous building. 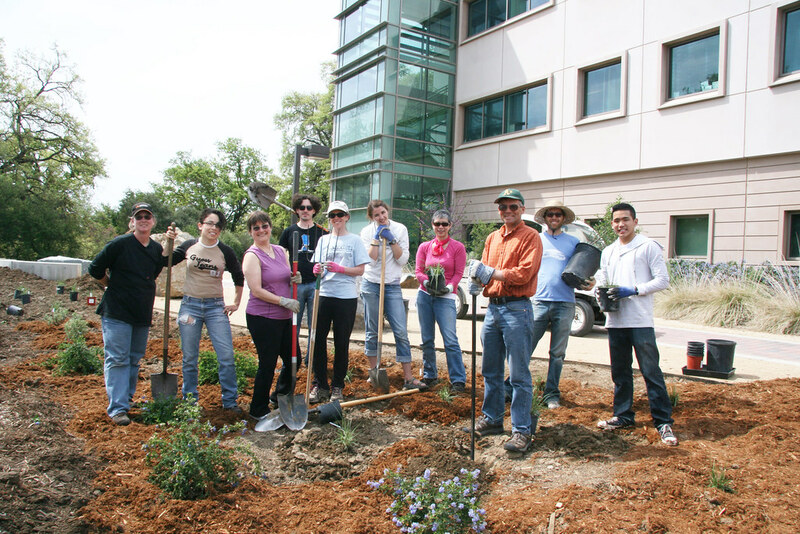 At the direction of Ryan Deering, UC Davis Arboretum GATEways Horticulturist, volunteers planted selections from the UC Davis Arboretum All-Star collection. All the plants chosen for this area are native to California and noted for their attractive, easy-care and low-water needs. Representatives from the UC Davis Arboretum GATEways Project worked closely with former Chair and Professor Emeritus Peter Schiffman and other Geology Department faculty and staff on the creation of this educational landscape which already serves as an outdoor classroom where students learn to identify rock specimens from throughout the state of California. Further enhancing this area by filling in the landscape around the rocks serves to welcome visitors and invite them to investigate the work of the university and learn more about geology.